For artist Simon Blackmore, the nature and history of musical translation and its relationship to technology has provided a rich area for inquiry. This exhibition brings together three related works that use the language of music to convert one form of information into another: Weather Guitar, a Flamenco guitar that "plays" to changing weather conditions via an interface with a set of exterior weather instruments; Audio Monitors, a pair of speaker-like objects that don't broadcast sound, but rather listen to the environment and count down the seconds and minutes of silence, only stopping at 4' 33", the length and title of John Cage's iconic silent musical composition; and Sticks, a computer-based piece that utilizes a modified version of ASCII, an early binary computer code, to transmit text messages across the gallery by the rhythmic clicking of hand-held wooden sticks. Blackmore's work is characterized by an inventive, DIY approach that draws on influences such as hobby-style electronics, open-source software, and lo-fi aesthetics. The resulting "performative" sculpture and installations are not, however, just about revealing the inner workings of things that are usually invisible, but rather an attempt to tackle the more philosophically thorny questions that surround our increasingly complicated relationship with technology and the power it holds over us. It perhaps should come as no surprise that Blackmore is himself a musician, but his choice of instrument might come as a shock: acoustic guitar. The artist has played the Flamenco guitar, one of the most traditional of instruments, for many years, and has recently spent time in Spain to perfect his technique. But he also creates and performs experimental music as part of the Owl Project, a collective of artists who have appeared throughout Europe playing sculptural electronic instruments of their own design. It is in this clash between the old and the new that Blackmore's main interests lie, and the works in this exhibition all speak of the artist's efforts to humanize technology, grounded by an attitude of playful subversion. Simon Blackmore lives and works in Manchester, England. This is his first exhibition in the United States. Simon Blackmore gained a First Class honours degree in sculpture at The University of Wales Institute Cardiff in 1999. In 2001 he completed an MA in Creative Technology at Salford University. He now lives and works in Manchester and works primarily with sound and custom-built technology. 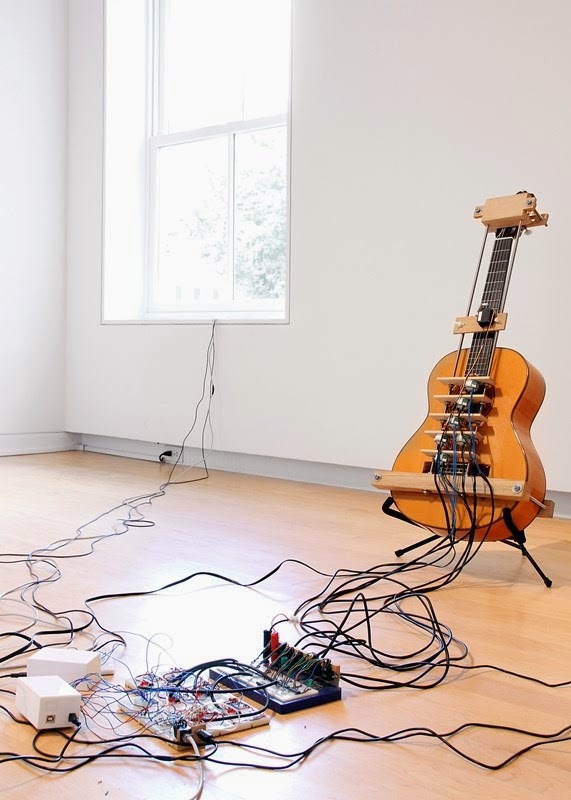 Recent projects have included: ‘Weather Guitar’ (a machine to play a guitar according to the weather), shown at Ikon, Birmingham in 2005. ´LSD Drive´, (a computer CD drive hacked to read light rather than data) shown in Perimeters Boundaries and Borders, part of f.city festival, Lancaster in 2006. ´Web Stream Boat´ (A low-tech interface in the form of a boat, designed to navigate through live web streams) developed during a ´Visiting Arts´ residency at Universidad de Andes and exhibited at Site Gallery, Sheffield in 2007. The sculptures often have a relatively lo-fi aesthetic drawing on influences from woodworking, hobby style electronics and open source software. The time consuming process of these works aims to question the role of the individual in relation to the mechanisms of a technologically driven society. Alongside his solo practice Simon also collaborates with Antony Hall and Steve Symons under the name Owl Project. Combining rustic woodworking, electronics and experimental music, pieces such as ‘Sound Lathe’, ´Log1ks´ and ´ilogs´ have been exhibited and demonstrated live nationally and internationally. In 2007 he undertook a Berwick Gymnasium Fellowship. wires and hand-made wind sensors. The sensors rotate to monitor environmental changes such as wind speed, rainfall intensity and wind direction. This information is transmitted to the guitar through a series of electronic circuits. It is translated into a mechanical action by six small motors with plectrums attached, plucking the individual guitar strings. Blackmore has taken great care to make the workings of Weather Guitar as flexible and modular as possible, allowing for it to be incorporated into a variety of settings. He has kept the level of electronics to a minimum and has left the inner workings exposed. The tangle of wires spilling out across the floor, the uncovered circuitry and do-it-yourself appearance makes the process clearer and gives the work an intentional, comical feel.